Spring Break is right around the corner here in Polk County, and families are gearing up to enjoy vacations both near and far. These vacations though can be hard for those who are unemployed, especially if their vacation involves traveling. While the financial strain alone is difficult to handle, the idea of leaving town in the middle of a job hunt can be daunting as well. So, how can you keep up your career search even when you aren’t at home and local? Resume revision. Your resume should never be static. A dynamic resume, one that is continually updated, modified, and improved, is one of the best ways to be noticed by a potential employer. Even if you aren’t home, you can take time in the car, during nights in a hotel, or even during moments sitting on the beach to pull out your phone, tablet, or hardcopy of your resume and tweak it. Add any new volunteer opportunities you participated in, update any recent work information, and be sure all of your contact information is up to date and being monitored continually. You don’t want to miss any calls or emails about an opening! 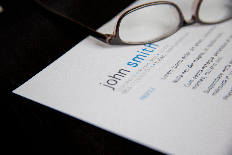 This is a great time to review your resume for any typos or grammatical errors as well. Check your email! Not only is this important if you are receiving emails from potential employers, but it’s also important if you receive notifications from recruiting companies, online job hunt sites, etc. If a possible employment match comes up, but you miss the email, it could have already been filled by the time you see the posting and get your application in. Take time each day, even while on vacation, to review your emails and make sure you’re not missing out on something important. Follow up. If you’ve had any contact with potential employers or HR staff, follow up is a key component to your job hunt. Even if you didn’t get a specific position, you should follow up with your contact person at that job, or the person who interviewed you, and thank them for the opportunity. This reflects well on you, and could come back to benefit you in the future. Follow up is something easy to do regardless of how far away you are from home, since it can be done through an email, a phone call, or even a handwritten note. Use your time enduring a road trip to your destination, or lazy moments by the pool, to type out (or write out) a few follow-up thank you notes to your business contacts. Tired of the stress and strain of job hunting? Why not let us handle the stress of searching for the perfect position for you? PHR Staffing Solutions provides top-quality applicants for businesses throughout the greater Polk County area and beyond, and we can find the ideal match for you based on your skills and qualifications. We are hunting for your best job opportunities even when you are on the road and away from home, so you never have to worry about missing out. Give us a call or apply for one of our current openings to get started!